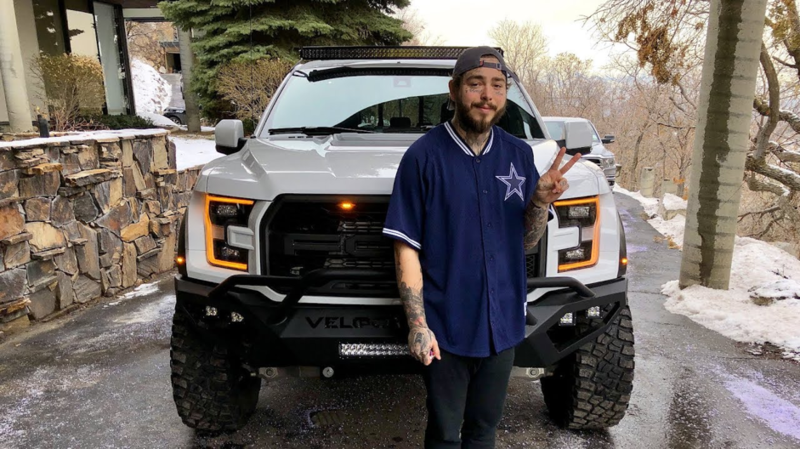 Musician Austin Richard Post, known professionally as Post Malone, did not miss the chance to get the Hennessey VelociRaptor 6×6, clearly inspired by the G63 AMG 6×6. See The Rock give away a souped-up F-150. Get the deets on the VelociRaptor. The Texas tuner made a lot of modifications to transform a F-150 Raptor into the VelociRaptor 6×6. Hennessey stretched the pickup and fitted a bespoke bodykit. All three of the VelociRaptor’s axles can be locked to maximize off-road performance. 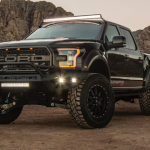 The F-150 Raptor’s twin-turbo 3.5-liter V6 was fettled to deliver 602 hp and 622 lb-ft of torque. And it came with a special gift from Hennessey. A custom mount, sculpted to look like twisted barbed wire to match Malone’s face tattoos, for a .05-calibre machine gun slots neatly into the bed of the pickup. See Malone take delivery of the beast.